Last month, I wrote an article about productivity. I’m curious – how many of you took me up on my challenge? Don’t remember what it was? Save yourself some time! Schedule an autoresponder – Let people know that you are only checking email twice a day. Doing this will help senders problem-solve on their own, if the matter is urgent, or give you more space to respond in the future. Put your phone on airplane mode – Set aside chunks of time to get specific priorities accomplished. Have you tried the Pomodoro Technique? Say no – a lot. Period. I hope that you tried at least one of these suggestions (or maybe you came up with one of your own – I would love to hear if you did)! More time is great. It gives us the space that we need to do the things we love. Or as my husband says, L-U-V. For those of you who don’t know, in addition to leading the business market with the highest growth in the USA at Apple (that’s right – I said it! ), Domenick is a singer-songwriter. When his ballads aren’t about clowns fighting or cherry bombs, they revolve around relationships. I promise that there are more words to the song – in fact, the song is really about how caught-up we all are in being “busy” – but these are the most important. (Please don’t mind my up-and-down shooting or my wobbliness – this was my first attempt at Facebook Live.) Click on the image to hear a small piece of the song! 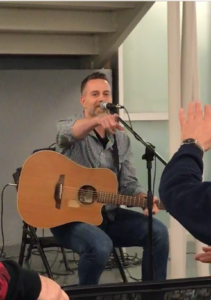 He graciously hosts an open mic at the Toms River Branch of the Ocean County Library on the first Wednesday of every month. People from all walks of life join him to sing, play instruments, read spoken word, and listen. There’s a lot of love in the room. Since February 1st, I hope that you’ve caught some of our members sharing the reasons why they love the Greater Toms River Chamber during our “We HEART GTRCC Campaign”. If you missed it, you can find them on our YouTube Channel. Join your neighbors at Member Connect, share a meal with the people in your building, stop-in their place of business to say hello, shoot them an email if you know they’re having a hard, or an awesome, time – there are some many ways to be a part of the GTRCC mission of connecting our community. We are all in this together – and knowing that makes me feel the love in February, and throughout the year. PS For the rest of this month, let’s love our fellow Chamber members even more! Snap pictures of yourself and other members and get a little social – tag the GTRCC (#trchamber), #WeAreTR, and #loveyourchamber! PPS Get ready for an awesome offer from a friend of mine – someone I hold very near and dear. Details are headed your way in the next week. Want to talk about community?! Get ready – it’s coming your way! By Noelle Carino| 2017-02-14T21:45:18+00:00	February 13th, 2017|Featured|Comments Off on L-U-V from the GTRCC.